Last month I went through my scrap binds and pulled out all the strips - long rectangular pieces with at least one straight edge - and then I put them in a box. This weekend I took them all out again. I picked the easiest block for different sizes of strip scrap - log cabins. Every log can be a different width and it does not matter, your log cabin can continue without issue. I picked blue as there were a lot of blue strips and it always makes me happy to sew with blue fabric. 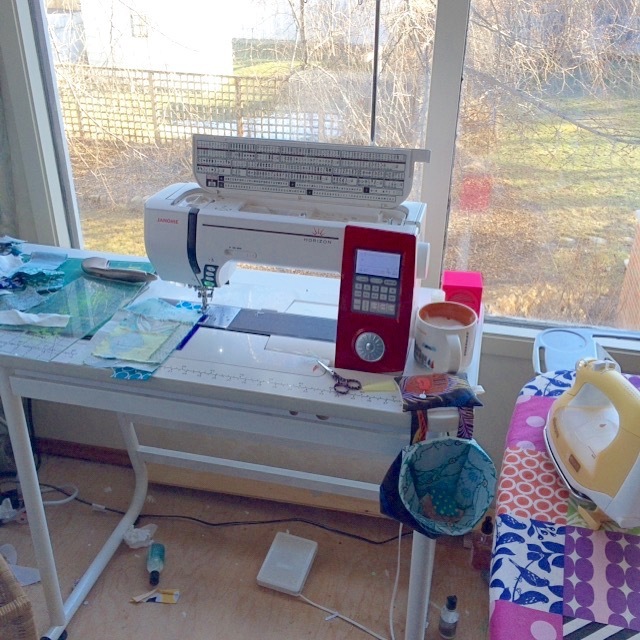 For the first several rounds I could sew, lean over to press and then trim right on my table. Once the log cabin got too big I hopped up to the actual cutting table with each log. I made giant blocks - about 30" square, more or less. This was block one, finished on Saturday night. I decided just random fabric placement was working fine - I mostly looked for the next strip by size. This morning I made another. I figure it takes me about 1.5 hours to make one of these big blocks, working fairly steadily. At this point it was lunch, and time for a long walk - I managed 7700 steps today, I am in training for QuiltCon. I figured I did not have enough blue, so I later this afternoon I started a green one. Before supper I had three finished. After making the green one I was almost out of green scrappy strips, but I also realized that I had enough blue left for one more block. After supper - my DH cooked and did the dishes and it was yummy - I made the last one. This is not a great photo as it was dark and in my hallway, and I edited it heavily, but you get the gist. A 60" quilt top, all from scraps! It's a bit scary that I can name almost every designer of every one of those fabrics too. 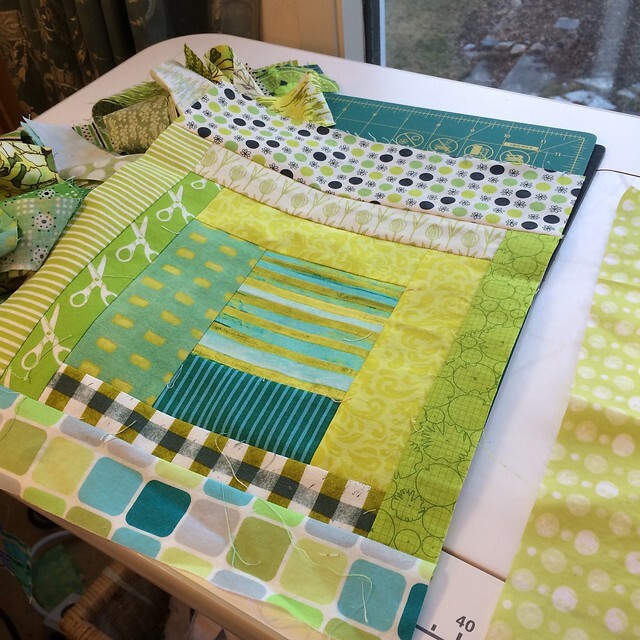 I know that the February Scraptastic Tuesday link up is not opening until this Tuesday, but maybe you are inspired to join Nicky from Mrs. Sew and Sow and I now. 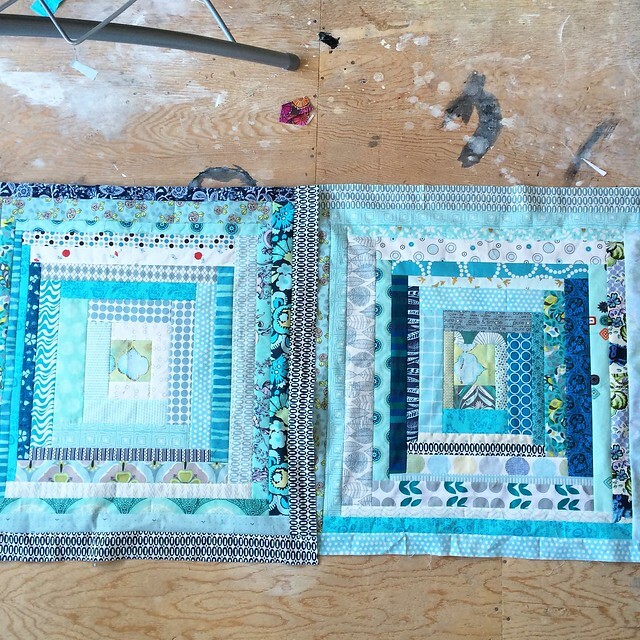 Those scraps can turn in to lovely quilts. I might have to start another, I have a lot more scrappy strips. These are fab! Sometimes it's lovely to just sew fabric together without too much thought, and create something so quickly. I love that you are in training for QuiltCon!! I will try and blog something scrappy to join in tomorrow (I always forget!). 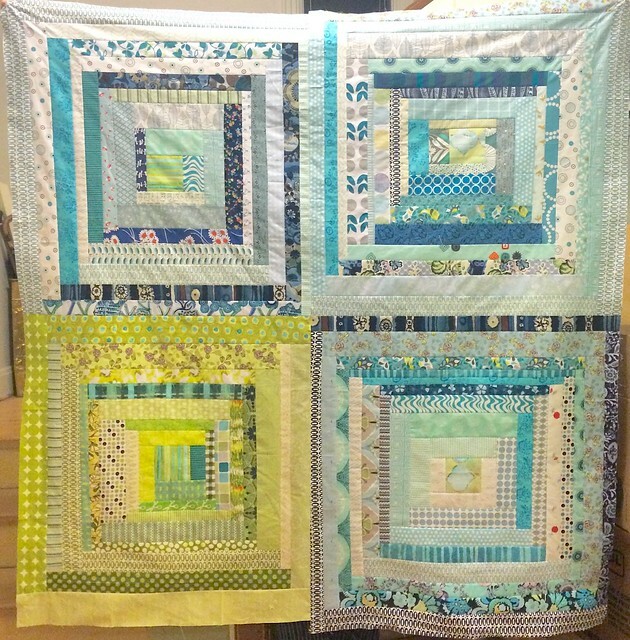 Great quilt top, love that you made it with scraps! Great idea! 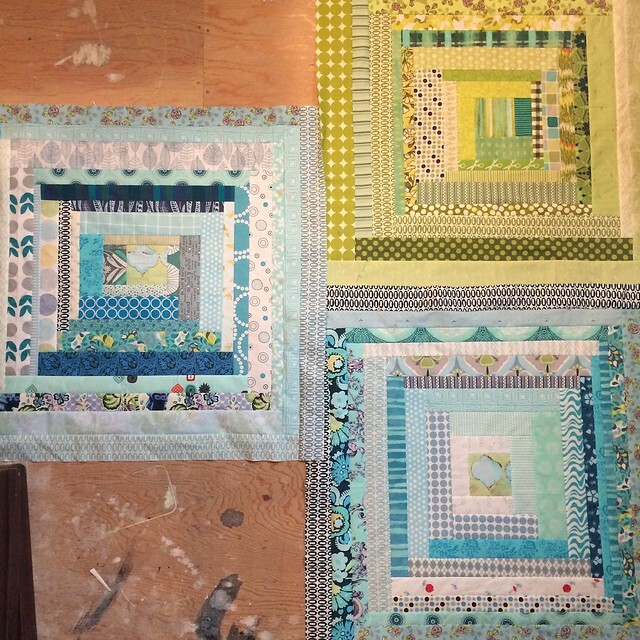 I am working on a few scrap quilts too! I'd be tempted to cut the blocks and introduce a bit of the green into each of them. But that's just my ornery approach. You do have some lovely fabrics. What a great way to use up scraps. Your finished blocks are gorgeous. I have lots of leftovers from jelly rolls and scrap bags and this would defintiely be a great use for them. I really love these blocks! Glad you are training for QuiltCon. See you soon. I'm so glad you decided to go with four blocks! 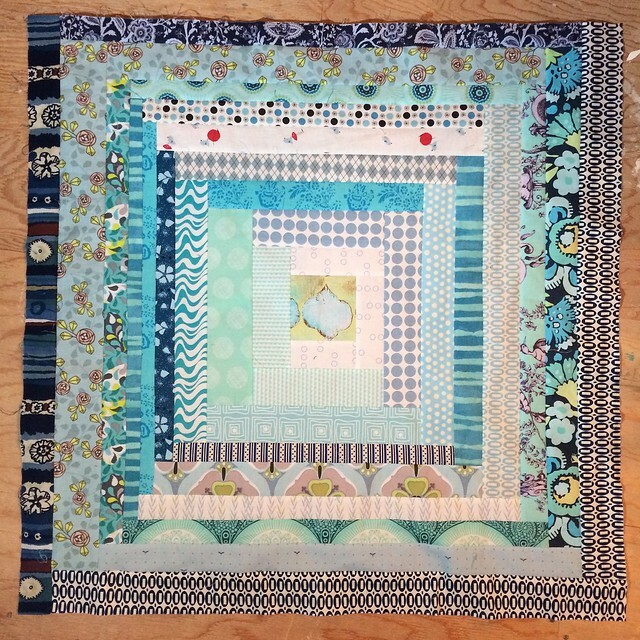 What a gorgeous quilt this will be! Love this Leanne! Especially the green and they compliment one another beautifully. Your centre piece choices anchor the quilt well. I'm looking forward to seeing the finished quilt! That green block really grabbed me, such a nice counter-point to the blue. Great use of scraps. Such a good idea to make these large blocks. I have two bins of strips, most of them trimmed from yardage to get the straight edge, I wonder if they could be used in this way, your strips all look pretty even. I am liking this big block idea. Good for you! WOW!! 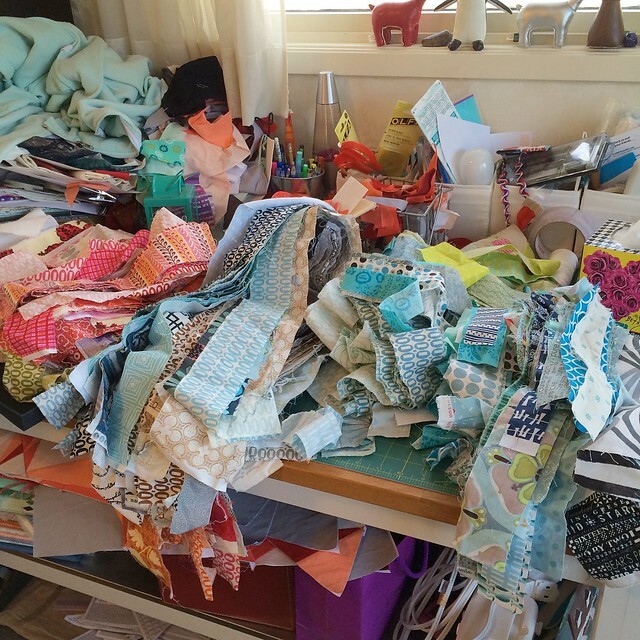 I wish I had that many scraps... As a new quilter, I eagerly awaiting my turn to play with scraps! The fortunate/unfortunate part of this is that I've also fallen in love with English paper piecing hexies, so I use all my smaller scraps for that. :) Thus, it's taking forever to come up with a good stash of scraps. lol Thanks for sharing your beautiful squares. I always look forward to seeing what you're working on. Great use of strips. Seeing this has given me an idea for my own scraps. Have fun at QuiltCon. I'm not going this time but enjoyed meeting you in Austin. Scraptastic Tuesday - February Link is Open!